Camping near Nada Lake during our backpacking trip into the Enchantments area of the Alpine Lakes Wilderness (go here – https://60before60.wordpress.com/2013/10/03/62-backpacking-the-enchantments-snow-lakes-trail-to-nada-lake/ – to read about our hike to Nada Lake), isn’t this quite the view to enjoy while sipping the morning cup of coffee? With a view like this, it was almost easy to disregard the fact that even though the sun was shining, it was only 27 degrees F and our little tent had frost on top of its rainfly. We knew it was going to be cold during the night the day before when we packed in, so came prepared with plenty of warm layers of polar fleece clothing. I had even brought a few of those packets of Hot Hands hand warmers and tossed a couple into the bottom of my sleeping bag before turning in for the night. I slept very comfortably, and was glad I had warm feet. Not long after we had finished our morning coffee and breakfast, we began to see more hikers heading in, and others packing out. The weather forecast had indicated that the conditions would be improving after that first day of snow and cold, and it appeared that even though the Government was in the middle of a shut down, word was getting out that the Alpine Lakes Wilderness was not one of those Government areas that was closed. This was a National wilderness area, and while the toilet building at the trailhead was padlocked and had a sign on its door that it was closed due to the Government shutdown, the parking lot at the trailhead was open, there were no barricades anywhere, there were no armed guards like some people were saying were guarding some of the National Parks and Monuments, and this Wilderness was open for business. 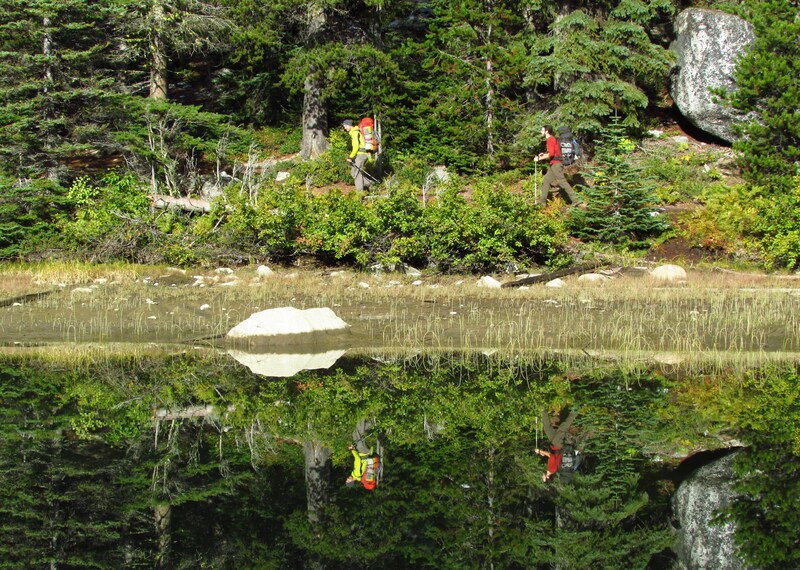 Some of the hikers stopped by our camp as they passed by Nada Lake to take a short break and enjoy the view and shared with us what they knew about the trail conditions near Snow Lakes. 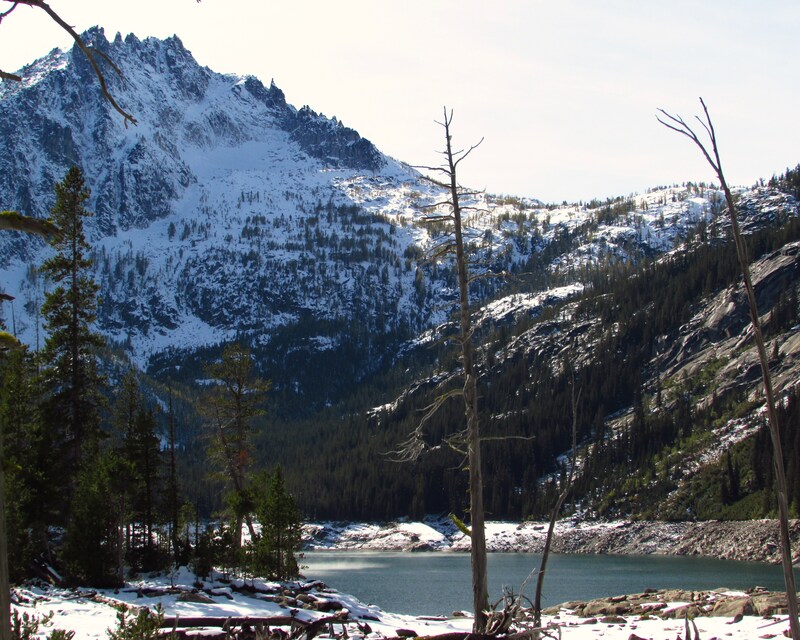 The two Snow Lakes were about 1,400′ higher in elevation than where we were at Nada Lake, and as we had feared, it was reported that the snow there was at least six to to eight inches deep. Some of the hikers were heading back down to the trailhead because snow and ice was built up to such a degree on the rebar steps on the huge granite slabs that must be crossed, making entry into the inner core area of Enchantments impossible. Our original plan was to pack up our camp after breakfast and move to one of the campsites at Lower Snow Lakes so we would be in a better position for day hikes into the inner core area, but the idea of camping on snow and not being able to go any further didn’t sound very appealing. Instead, we changed our plans and decided to simply keep our lovely campsite there at Nada Lake and day hike up and back to the Snow Lakes instead. Here’s a view looking back at Nada Lake as we started up the trail Snow Lakes. This photo is from one of my favorite sections of the trail. 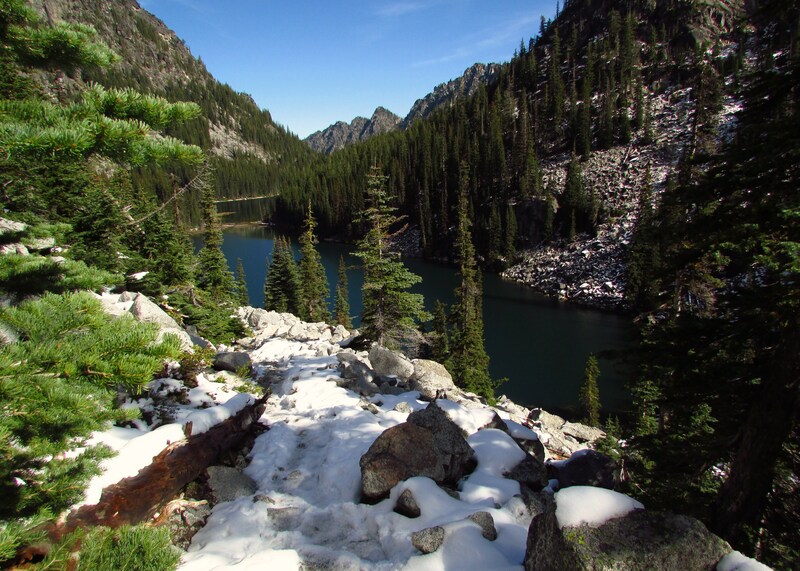 As I mentioned before, the Snow Lakes are about 1,400′ higher in elevation than Nada Lake, so as we continued to climb along the trail, we continued to find more and more snow. This photo was taken about where it became necessary to put our ice trekkers on our boots for better traction along the ice covered talus. I particularly enjoyed this part of the trail as I stood next to this snow topped boulder. The snow its roof, it reminded me of a little house. Because of the recent low temperatures, Upper Snow Lake was frozen over. Its water was so low, with a big bathtub ring, it seemed more like a puddle to me, and I was glad that we had kept our campsite down at Nada Lake. 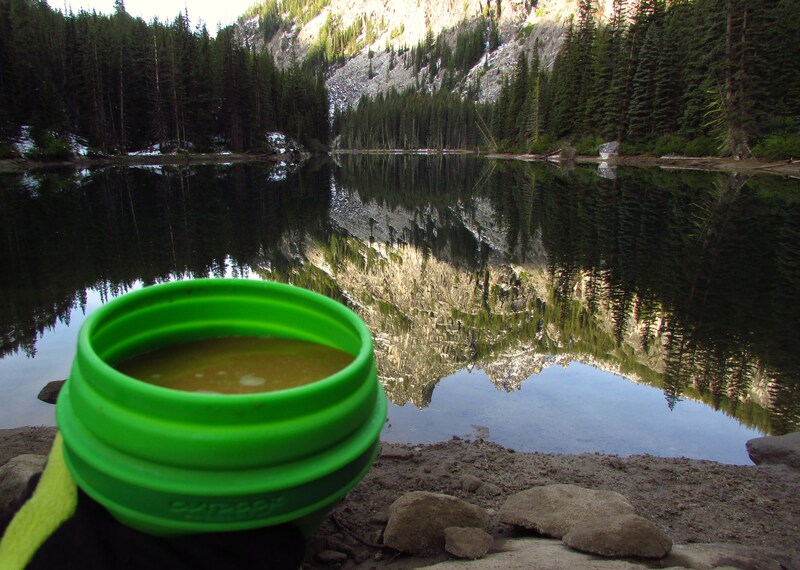 I felt we had the better reflective view for coffee and knew the temperature wasn’t as cold where we had camped, but how about that mountain peak behind Upper Snow lake? I thought it quite impressive! 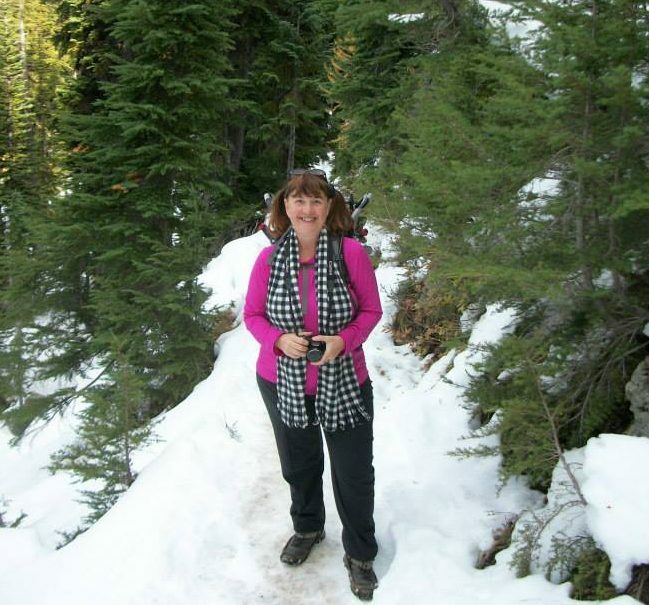 We had brought a picnic lunch with us on this hike and sat on the shore of the Lower Snow Lake on a boulder warmed by the afternoon sun as we ate our lunch. After lunch we explored around the two Snow Lakes a bit before making our way back down the snowy trail to our camp at Nada Lake. More information about the trail to Snow Lakes can be found on the Washington Trails Association website here –http://www.wta.org/go-hiking/hikes/snow-lakes .